New research launched today by Yoopies, one of Europe’s biggest online care platforms, reveals the true effect that the government’s 30 hours free childcare scheme has had on hourly childcare costs. Whilst the scheme has been purse friendly for parents with offspring in funded preschool or nursery places, families using in-home care - such as nannies - have not been so well off. Prices hiked by 4.1 percent in the last year alone, increasing from £8.16 in 2017 to £8.50 in 2018. The boost in rates has been seen just one year after the government launched its 30 hours of free childcare scheme in England, an initiative which was supposed to reduce childcare costs rather than increase them. The 30 hours scheme has put financial pressure on early years education providers, causing a significant 47 percent increase in closures in England in the last year alone.2 With fewer funded places for young children, parents are turning to nannies as a backup, creating a higher demand for in-home care and inflating hourly rates. Research from Yoopies supports this by highlighting a clear correlation between high childcare costs in certain regions and low government early years funding. Take the North East of England for example, according to the research the area boasts one of the highest increases in funding per child in England, +10 percent, and yet it has one of the lowest increase in in-home childcare costs at just +3.54 per cent. On the other end of the scale, it’s the North West where funding increases are the lowest at 4.3 percent, yet childcare costs peak at +8.85 percent. 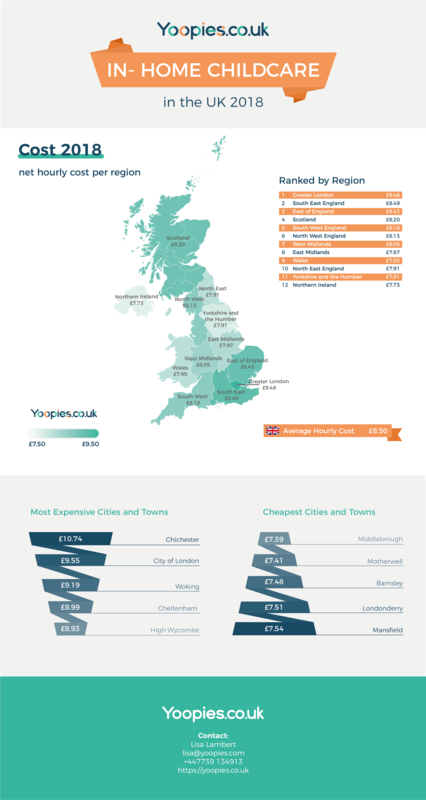 As part of the research, Yoopies also analysed hourly in-home childcare costs across 180 UK towns and cities as well as the major regions, highlighting a huge regional disparity. The study reveals that along with Northern England, the rest of the country has seen a dramatic spike in costs. The East Midlands has been hard hit by a jump in costs of 6.4 percent, followed by the South West with increases of 6.01 percent. Considering individual towns and cities, the most expensive town in the UK is no longer Central London but Chichester. The upmarket cathedral city in West Sussex, now tops the childcare ‘rich list’ with in-home carers demanding an average of £10.74 per hour, £2.24 above the UK average. At the other end of the scale is Middlesbrough, where families get a much better deal. The North Eastern town is proving to be the most purse friendly area when it comes to childcare with the average carer costing just £7.39 per hour, 31 percent less than in Chichester. For further information, please contact Lisa Lambert at Yoopies on lisa@yoopies.co.uk or call 07739 134 913. Methodology: Data based on the childcare prices provided by over 525,000 caregivers on yoopies.co.uk between September 2017 and September 2018 and an online survey conducted between August 13 to September 3rd using a convenience sampling methodology. Caregivers freely give their prices on the Yoopies platform, allowing Yoopies to have the most comprehensive overview of childcare prices in UK. 1 Cost based on a full time working parent leaving their preschool child at home with a sitter from 8am - 6pm daily, 5 days per week so based on 50 hours of childcare per week. December 2017: We reveal who's been Naughty and not Nice!